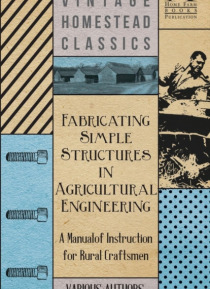 This text comprises a detailed guide to fabricating simple agricultural structures, being a comprehensive manual of instruction for rural craftsmen. Including a wealth of helpful information on tools, materials, methodology, and including clear instructions for their uses in the construction of a variety of farm buildings, this is a text that will be of much value to the modern farmer. This book a… lso deals with the application of oxygen cutting and arc welding to fabrication. The chapters of this volume include: Materials and Sizes, Linkage Mechanisms, Levers, Pitman Arm for Binder Knotter, Connecting Rods, Cranks, Bell Crank Levers, Castor Wheel Mountings, Plummer Blocks, Plummer Blocks or Axle Bearings, Split Plummer Block, Bearing-Mountings and Brackets, etcetera. We are proud to republish this antique text complete with a new introduction on metal work.